Heat oven to 375 degrees. Spray 8 regular-size muffin cups with cooking spray. Set icing aside. Separate dough into 8 rolls. Press into and up sides of muffin cups. Spoon 2 generous tablespoons of pie filling into each dough-lined cup. Bake for about 18 minutes or until golden brown. Cool slightly, and then drizzle icing over top. Preheat oven to 375 degrees. Unroll crescents and place 1 slightly heaping tablespoon of pumpkin pie mix on each crescent. Starting with the large end, roll the crescent over once and slightly pinch the sides to contain the filling. Continue rolling (a little filling might leak out, that's ok). Place on a parchment paper lined pan. Bake 10-12 minutes or until browned. Combine glaze ingredients until smooth. 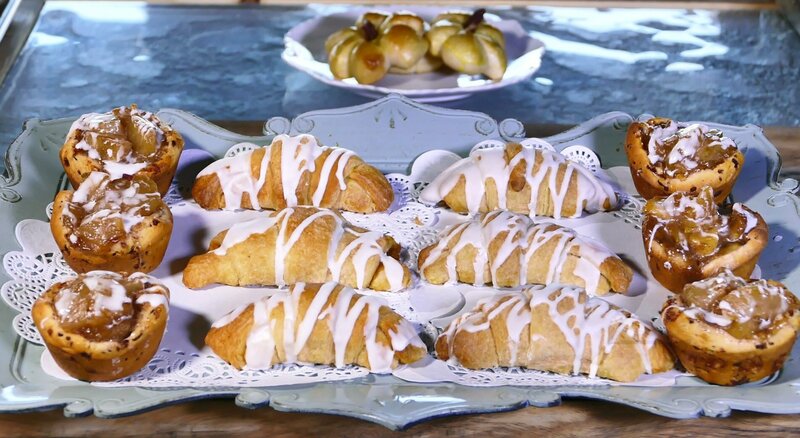 Drizzle the glaze over the crescents. Serve warm.